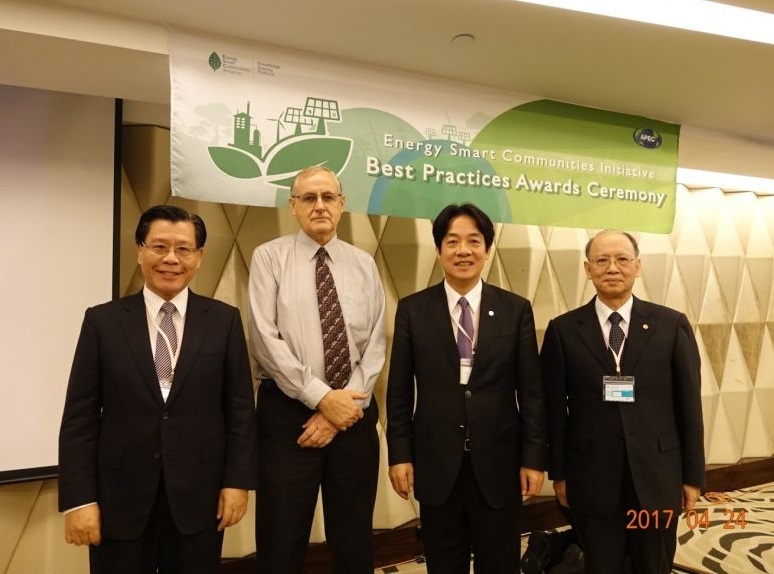 Three green energy projects from Taiwan picked up honors April 24 in Singapore at the third Energy Smart Communities Initiative Best Practices Awards Ceremony overseen by the Asia-Pacific Economic Cooperation. The Smart Park Information and Communication Technology Re-engineering Initiative and Great Tainan—The Solar City won gold in the Smart Transport and Low Carbon Models Town categories, respectively, with the Penghu Dongjiyu Microgrid Small Power Supply System taking silver in the Smart Grids category. Present to accept the honors on behalf of the three projects were Chen Ter-shing, vice minister of science and technology, Tainan City Mayor Lai Ching-te and Chiang Yi-fu, chairman of Chung-Hsin Electric and Machinery Manufacturing Corp., respectively. The initiatives were among 197 submissions from APEC’s 21 member economies for the awards program, which also comprises the Smart Buildings as well as Smart Jobs and Consumers categories. After undergoing extensive examination, they were included in the 10-strong winners’ list announced March 3. According to the Ministry of Science and Technology, the Smart Park ICT Re-engineering Initiative project aims to transform the Central Taiwan, Hsinchu and Southern Taiwan science parks into innovative and sustainable digital eco-communities. The central component of the initiative lies in reducing carbon emissions produced by private vehicles. Through a combination of smart traffic control, parking and digital signage, as well as e-shuttle buses and a transportation app, the parks have slashed carbon emissions by 960 tons and saved 119,100 liters of fuel. Launched in 2011 by Tainan City Government’s Economic Development Bureau, Great Tainan—The Solar City project aims to build the southern Taiwan metropolis into a low-carbon city while fostering the development of the local green technology industry. Speaking at the awards ceremony, Mayor Lai said the program capitalizes on the city’s abundant sunshine by encouraging the installation of photovoltaic energy systems on public and private buildings, factories and agricultural facilities. Over the past six years, the 3,685 rooftop PV systems set up in Tainan have produced 251 megawatts, more than the 220 MW annual output of Zengwen hydroelectric power station in southern Taiwan’s Chiayi County. According to Lai, such impressive results helped Tainan become the first local government in Taiwan to claim gold in the Low Carbon Models Town category. Similarly praiseworthy is Penghu Dongjiyu Microgrid Small Power Supply System. Centered on Dongjiyu in outlying Penghu County, the system’s objectives include increasing renewable energy use, reducing diesel power generation, enhancing electricity supply stability and providing low-carbon power. It includes the use of electricity generation forecasting, remote monitoring for load predictions and a control system for three-phase equilibrium of AC power.